ArtworldNow visits the Fourth Plinth from ArtworldNow on Vimeo. Unveiled the 5th of March, Gift Horse by Hans Haacke (b. Cologne, Germany, 1936) is set atop Trafalgar Square’s Fourth Plinth. The bronze skeleton of a riderless horse features an electronic ribbon with a live ticker of the London Stock Exchange providing comment on the plinth itself. Built in 1841, the plinth was left empty due to lack of funds needed to build an equestrian statue of William IV. 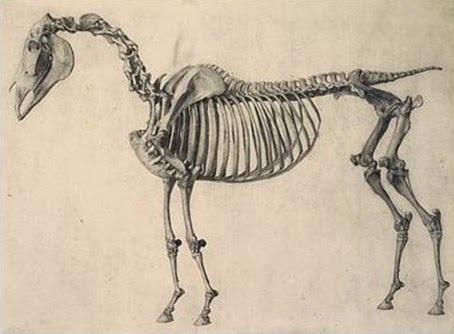 Gift Horse also references an engraving by George Stubbs, an English artist renowned for equine art. Haacke's new piece can also be seen as a critique of the neoliberal system, especially of Britain's Cameron-led government which has imposed austerity measures and is accused of supporting crony capitalism and a corrupt financial sector. Gift Horse thus reflects on themes of power, money and history.